The minimum bending radius is just 4 mm. Sony recently released a video showing the display panel wrapped over a cylinder, while it's working. The panel has more colors and contrast ratio than it's competitors. 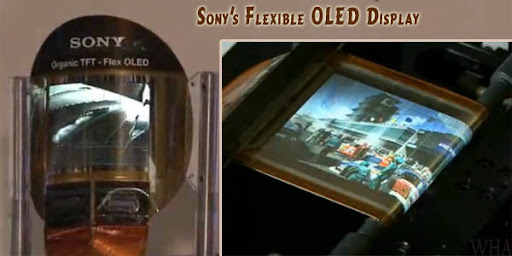 In fact Sony is not alone there is other big brand Samsung also has shown it's flexible OLED screen prototype last year. Soon many other brands will jump in this hot field. In future the sturdiness and flexibility of the display will bring ultra portable gadgets, OLED TVs and more. What do you say? Do you think we really need this? Share your views, the comment box is yours! Mobile phone gadgets wearable on wrist will be great.... looking forward to it. As more and more time go we will see the physical existence of most of the science fiction movie's gadget. This is just another indication. Well doesn't look like a screen. Looks like a water film. Cool gadget.